The trial version of EA Sports UFC 3 is scheduled to arrive on January 25 for EA Access subscribers. EA Access is an Xbox One exclusive, allowing members to try upcoming EA games, for up to 10 hours, prior to release, offering 10% off all EA digital purchases and more. It also gives users access to The Vault, which houses a growing library of EA games subscribers can play as much as they want. Users can subscribe to EA Access for $4.99 per month, or $29.99 for a full year. YES! This is why i am having both consoles. this is just for xbox one? I think ill wait the 5 extra days anyway. Time to start activating multiple accounts just like I did in UFC 2 10 hr trial. I'm not surprised. I already knew EA Access would have the 10 hour trial. But it's not that long of a wait realistically. 10 hours should last me until my January 30th Release. It's a Microsoft only deal at the moment. That's only 20 Days away. But the day is too close to DBFZ release at least for me. The nice thing about it though is you don't need the Champion edition to play the 10 hour trial. You just need an Xbox One and EA Access. But if you have the Champion edition you won't need to keep making accounts because you will have Early Access no time limit come January 30th. Woohoo, I can finally close the beta and update my Xbox. Hope I didn't fry anything for leaving it on so long. So at what time should we expect the trial to be available for download on the 25th exactly? Based on other games trials, I bet at least one of you knows? Lol your xbox is probably dead right now. It pulled through. If I did that with a Xbox 360, it would have caught fire and burned my house down. I'd like to know this to. I'm hoping for midnight, but that's probably a stretch. It could be anytime from Wednesday afternoon to midday Thursday. EA has recently been releasing games in Ea access the day before they announced it would be released. Wednesday instead of Thursday. Oh **** that's cool! Ya'll need to give me a heads up if it does indeed gets released sooner! It’s gunna be fun to play all the people on Xbox when the UFC 3 trial drops. i thought u was a ps4 guy? I am, but i’ve been thinking about going to xbox for UFC 3. At first i was all in but i still haven’t decided yet because of how low the Xbox player count is compared to PS4. The UFC 3 Xbox beta had at its peak around 7,000 players, but PS4 had over 20,000 ppl at one time. That’s a crazy difference that still has me deciding if i want to play on xbox or ps4. I’ve accomplished everything with UFC 2 on PS4 by being #1 overall for a long time. So i figured i give xbox a go with UFC 3.
apperently in ufc 2 xbox the top top players were better but after that ps4 had more competitive players due to the size. Its up to you, wanted to see how u progress in the leaderboards on ps4! Come on over. I'll give you a welcome fight. 2. Will any of the pre order content be availbe. You can only access the trial if you have EA Access. If you dont, you cant access the trial. I dont believe you have to download it again if its predownloaded. I shelled out a couple of bucks to be able to play it earlier. It's not a bad deal as you can play FIFA18 and Battlefront2 for up to 10 hours each. Awesome as I'm not going to buy those ever. I don't think it's unfair to PS4 as it's just nothing more than a second open beta test. What time does the ea access trial go live on the 25? I actually spent the $5 to get EA Access just for this. I did it last time along with a friend of mine to play EA UFC 2 for like, two or three days while we waited for it to arrive from Gamefly. Basically the plan here except I'm just waiting for the game to unlock. Saw someone say that it could be up on Wednesday. I guess I'll keep checking throughout the day tomorrow and hope that it appears. That would be a very welcome surprise. So I heard a little bird saying it could arrive today, not to get anyone's hopes up but its a possibility. Little bird in question is aaholbert so feel free to blame him if it doesn't. FYI, Madden was on EA Access Wednesday at 3pm. FIFA....Wednesday at 7pm. NHL.....Thursday at 12pm. Live....Thursday at 3 but the trial wasnt supposed to start until Friday. So we have a decent shot that UFC will follow the same pattern. Oh sweet same as here, good good, im hoping for 3pm today then, that way the download will prob be finished around 6. Btw if it does happen to release today it'd be great to have someone quote me so I'd receive a notification. Dont have a xbox to watch when its available so i'll need to drive to my brother's so I can start it. You’re fixin’ to have a lot of people wielding pitchforks at your door. How do I access the trial once I've subscribed to EA Access? Do I just open the game as if it's release day, or do I need to go through the EA access app? There'll be a tile on your dashboard for it. Just like any full digital game, but it will lock up after 10 hours. Just got my code. Impressions coming in the next hour or so. A code for the 10 hour trial ???? What do you mean your code? ... Nevermind. Why did you get a full game code already? Would you mind checking if Thiago Santos is in the game or not? You guys will have access to the full game soon. I expected to get to play the game a few days ago but it took them a while to issues codes this time (With UFC 2 we got the game 5 days before EA Access). Lol it's all good, have fun with the game man, you earned it. How soon are we talking here? Lobov too and anyone else who was shown in the compare section on the roster reveal. I'd also like to know about Santos and Lobov. Also, would love to know what weight classes can be combined. Thanks! I would love someone like JCVD, Edgy Brah, Bryan Callen or Sensei Seagal. Anyone mind screen capping Big Nog's moveset for me? I can still wait for it. Haven't figured out the controls. They say takedowns are still LT + R-stick > or < but their manual says it's ^ or >. They mentioned the ground game hasn't changed, but unless I'm severely mistaken, defending transitions was RT/R2 + R-stick, not LT/L2. So either someone f'd up and printed it wrong, and the whole EA UFC division is oblivious to it (which sounds too amateurish, even for EA), or they did change it and lied about it. I can still wait for it. Still haven't figured out the controls. They say takedowns are still LT + R-stick > or < but their manual says it's ^ or >. They mentioned the ground game hasn't changed, but unless I'm severely mistaken, defending transitions was RT/R2 + R-stick, not LT/L2. So either someone f'd up and printed it wrong, and the whole EA UFC division is oblivious to it, or they did change it and lied about it. The website team is bad, don't believe their lies. It'd be weird as hell if he didn't, since he has both those in 2. Dang, what weight classes can be combined? Thiago Santos is still shown under the compare section on the website. Do you have Gaethje and Till in there? Yes to the flying knee. Are the stamina changes from the beta noticeable? Do the fighters actually punch and move around much slower? You plan on streaming, Aaron? Probably in about 30. I'm trying to figure out this stupid gameface and get it to work. FYI all of the CPU/User sliders are seperate. I feel like stamina cost and damage will be the most used ones. Maybe mess about with GA turned off, see how that plays? How would I know once the Trial goes active? Do I need to go to a certain screen on my Xbox? Will it let me click UFC 3 in my games and apps and do it there? I don't remember how this works from previous releases. Jump into a 10-hour trial days before launch, starting now. Yeah see I'm curious as to what's up too because I see screenshots and captures on the Xbox Hub for this game of people playing right now. When you do try the overhand for a bunch of fighters? Obviously just as you play I mean. The stream the other day seemed to imply that pretty much everyone has the wild overhand as their only overhand punch which would be very unfortunate. Wanna see if that's the case for sure. I just tried and it didn't work, i'll keep trying. Yeah it's also not working for me though I'm still seeing these Japanese, Chinese, Korean, whatever symbols this is I can not differentiate, screenshots being uploaded to the Xbox Hub. OK, I'm jumping on twitch. I'm just going to be fooling around with custom fight now and the sliders. FYI, I'm only using fighters with AI customizations. I'm trying to test these. I shall join you bud. Just made some fresh coffee and I'm waiting on the Access trial to unlock for the rest of us. If you want to play against Anderson or Joanna at some point that'd be cool. Those are my two favorites, so I'm always interested in how they come out in the game. Aholbert was giving exemples when he said 3pm, he also said he was in eastcoast timezone, same as us, vancouver is pacific standard time. So we’ll have to wait until tomorrow? Who knows, it might still come out today. Don't toy with us like that, our souls can't handle it. That Yoel AI... Very good signs. This cuts deep. We're so close, but so far away. I just need to play. Go watch aholbert play. I'm practically the same thing as doing it yourself. I literally cant even watch any of the gameplay videos since playing the beta.. It's gonna be 12am GMT isnt it. And I'm gonna end up tired at work tomorrow aren't I? I've been watching since he went live. All love for Aholbert, but he's getting old. He doesn't move like I do, hit like I do, one gust of wind and he does the chicken dance.. Seriously, I would have been super happy being regular anxious/excited for release tomorrow, but now I’m kind of blue balled and upset. I wouldnt go as far as to say im upset because i am happy i know today. I will basically be able to play right sway if it does happen so that is cool. Aholbert getting destroyed by CPU Yoel was one of the greatest things I've seen in a long time. Yeah between that and somebody laughing that there is a real place called Simpsonville, I've had a fun time on this stream. I'm eager for the access trial to start now so I can get to watching some AI fights. See how the AI handles itself against each other. I had seriously never heard of simpsonville, **** is just hilarious. Don't waste your precious 10 hours on AI vs AI, or please share it so I don't have to ! Oh man, that's not a waste to me! I have an obsession with AI so I was probably going to do that anyways. I'll definitely record gameplay and share it. I usually do stuff like that in any video game that will allow me to do so. COD, WWE, NBA, FNC, ARMA, even going as far as to set up scenarios in strategy games to see how the AI handle each other when the player just does nothing. Stats and numbers fascinate me, probably stems from my Autism. Any one got the EA Access working yet? Or are we just assuming a Midnight EST start time? Mind using Big Nog and showing his moveset? I'm at work and will watch the archive later. I'm eager for the access trial to start now so I can get to watching some AI fights. To each their own bud. I like to know how the AI handles itself when the player is absent to look for issues in the way it approaches different situations. Seeing if it's more reliant on your actions or itself. Gives me a better understanding of how the whole system works when you're actually fighting them. For example, doing this in UFC 2 showed how little difference each fighter's AI had. They all fought so similar that you could watch Rumble V. DC and have Rumble shooting for doubles, while also watching Maia V. Magny and having the whole thing be a kickboxing fight. To each their own for sure. The only thing I know of the AI in this games is that I can put in on Legendary against Kabib and finish the fight in mount in less than a minute. Other than that, I'm very sure most of the actions from the AI are reactionary from your inputs (from standing at least). You can beat legendary mode standing very easily as well. Throw a feint and it will react every time. So just feint a jab then throw a head kick. You will land it every time (this was in the beta). This isn't a point on how to always win, just that everything on the feet seems like it's based on your inputs. AKA getting parried against the AI in the other UFC games like you are fighting Neo in the Matrix. I heard some of the Xbox demos have come out as late as 3 PM Pacific Time. So we'll know in about 15 minutes if it's coming today or not. I'm just assuming Midnight EST at this point. Until someone comes on here saying they're playing it I'm not gonna be refreshing my access page like that. I gotta work on some other stuff so I have plenty of time to spend with the game when it activates. We definitely are. Just a matter of when. Someone go check if its up now then. Hah. i just checked it’s not out yet for me. i’m in california. so who knows. i’ll restart my xbox and try that. Yep. Restart the Xbox. I thought since I had the game pre installed it would be quicker to install, but it's gonna take a few minutes. UFC 3 disappeared from my EA Access thing, but I haven't preordered so I guess I'll have to wait a bit longer. It shows it's available and installed, yet when I click "play", I get a message that says "you need to download an app for this". When I click "ok", it takes me to an error page in the store. Gonna try a hard reset and try again. Strange, I have the preordered game all downloaded and ready, but it still doesn't show up when I open EA Access, which is weird since it was there all the time when it wasn't available, you know, it just said "coming soon" until it well, came. Now it's disappeared and I've restarted the console and everything. Well, well, well... I am so pleased! Now to just get through another six hours of work and then... IIIIIIITTTTT'SSSSS TIIIIIIIIIIIIIIIIMMMEEEE! Open it through the game itself. Worked for me, after a reset. I've been watching some videos in Youtube and Twitch. 1/ 1 or 2 new overhands animations would be very welcome. Otherwise, I Love This GAME !!!! Haven't seen a rag doll yet ,is it in ? About half a hour still before I can make my way to my brother's and play the living crap out of that trial! WOO! Anyone know if I can play ea access trial games on other accounts than primary ones on the xbox? And is live Gold stuck to only one account? If it ain't, my gamertag from back in the day was "ace1888" so feel free to add me. The EA Access version includes the launch patches? The game is looking good, I'm watching one guy (Dman) and he actually said he's gotta start pacing himself better after getting KOed a few times...love it! There's one SMALL thing I was reminded of though watching these videos...I can't tell if someone is wanting to touch gloves or not. I don't generally initiate a glove touch at the beginning of fights, but if I see it I'll either touch or just stay back if it's like a Diaz or McGregor player lol. But I really can't even tell if they are extending their fist out for one now with the new animation. I'm pretty sure I've accidentally just started swinging on a few guys because I couldn't see the glove touch animation. There's on SMALL thing I was reminded of though watching these videos...I can't tell if someone is wanting to touch gloves or not. I don't generally initiate a glove touch at the beginning of fights, but if I see it I'll either touch or just stay back if it's like a Diaz or McGregor player lol. But I really can't even tell if they are extending their fist out for one now with the new animation. I'm pretty sure I've accidentally just started swinging on a few guys because I couldn't see the glove touch animation. Did you guys change your mind on including rag doll ko's in UFC 3 ? Haven't seen one in the 10 hours of play, everything looked animated. So many strikes on the game it's amazing, you can really keep your opponent guessing if you have many kicks as Diakiese. Love the feeling about knocking opponent out with jumping ninja side kick. Can anyone tell me if any changes have been made to the online stats that are tracked? I'm hoping to see individual fighter records and things of that nature. I love the xbox controller, but just not for this game. The ps4 controller is starting to feel a lot better when playing, but i love the joystick which helps a lot for the submission game. no more title defense leaderboard and no more looking at your opponents record after a fight through Fighternet. why did they take it out?? That was a good part when fighting someone good to check their record. That's very disappointing to read. Hopefully they throw us a bone at some point and flesh that out. There's a lot they can do with that and it doesn't require any gameplay fixes. Yup, i agree. I don’t understand why they did that. I’m pretty bummed out that there is no Top 100 Overall leaderboard now. I feel like ppl complained because how the old leaderboard was in UFC 2 and now we get this season crap that looks like it resets and the next season starts. The point system is also a lil weird. The overall 100 leaderboard should be there but not the default leaderboard. The default should be one that resets every season. It keeps things fresh and current. Not all the best players are going to play as much as the guys who grind from the day the game comes out either. Seasons is a better way to measure the most skilled players who are currently playing. I like that better. What's everyone's thoughts on the KO's? My xbox controller is going to vibrate out of my hand playing this game. It vibrates so loud and so much it's waking up the baby. Those shogun animation's jabs are weird! 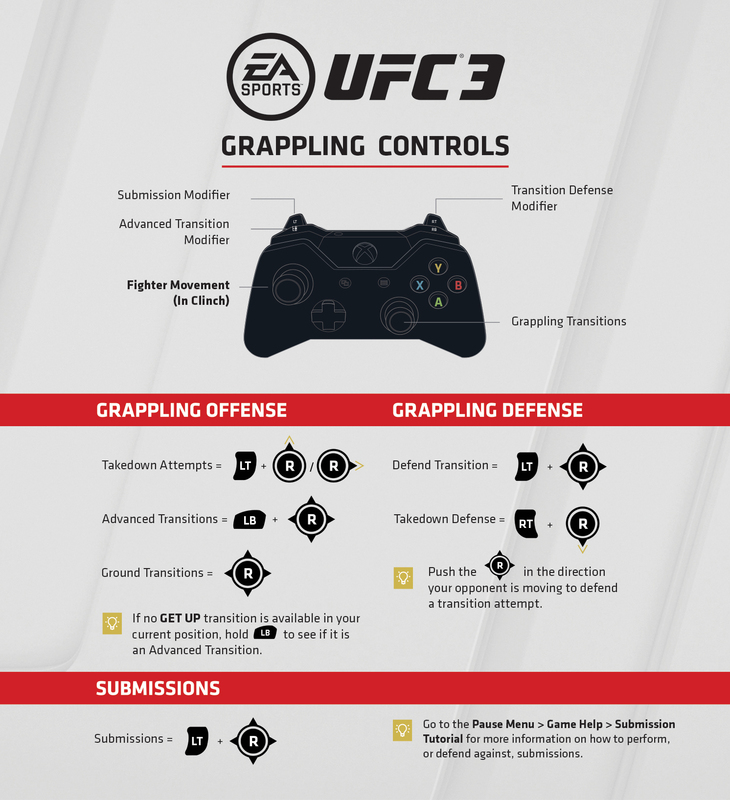 I,m on Ps4, beleveme this controller seems to have been created to play UFC 3 !! Why should I buy this controller? Is it better than a scuf? Didn't this controller get quite a lot of bad reviews? I began to play online boxing/Ufc games with the great Fight Night Round 3 (2006). I,m a competitive online player (yes, i,m in my 40 but i,m very competitive lol) and all i want is the best options to play online in the best possible conditions. This s the reason because at this moent i have the best connection online in my country (Barcelona, Spain), the best monitor and the best controller IMO. Do you have the Rev1 or Rev2 edition of this controller. Does the controller itself feel good? The buttons feel okay to press and everything? How long have you had it? Some people report it breaking. I just watched Solid stream career mode and it's going to need quite a bit of adjusting it seems. I'd def keep expectations low for career mode (mine were pretty low after UFC 2 anyway). On this my whole career mode stayed the same exact champions from the start to end unless you win it in your division then obviously you take it. Seems weird.. 20 years same champion in every division. Also not a fan of the scripted rivals layout, had a prospect 4 fight contract to break into to top 15 (travis brown, being ranked 15 and my rival) lost 2 in a row still fought travis Browne on the final contract fight, won and broke into top 15... seems kind of weird after a 2 fight losing streak and pretty much makes the other fights apart from rival fights pointless. Yeah it's way too scripted for my taste. They want to hold on to the reigns in order to provide the best experience possible, but not much replay value as you can know what comes next if you've been through it. Absolutely yes, the controller feels very very good, and is strong like a rock, I dropped on the ground like 20 times and works as the first day lol, is very "solid". It reminds me of a CAF journey type thing with the structured chapters but with less cinematics. Like you said destroys replay value and it makes every fight apart from the rival fight practically void. Beat rival - next chapter /lose to rival - fight two more people no matter the result then fight rival again until you beat him... repeat! To be honest I'd rather fight a CAF with decent stats when you get to the top and see the rankings/champs chop and change than fight a undefeated in 20 years, 55 year old Stipe Miocic at least it's slightly more organic but that's just my personal preference..
Like you said makes it kind of void without the immersion of other fights going on around anyway. I dunno it is what it is..
Yeah Carrer Mode is another disappointment, I was expecting some kind of interaction during weigh-ins a-lá UD3. That aside, hope they add a lot of fighter's in the months to come, because the omissions are killing me. I guess I'll stick to my normal Excel spreadsheet Universe Mode and sprinkle in a couple of grand prix's via Tournament Mode. I just want to play through multiple years of a real life UFC Calendar with rankings and champions that actually defend their belts. I want to be able to watch fight cards I'm not apart of, or even jump in and play. I really hope they can have a Universe type mode in UFC 4.